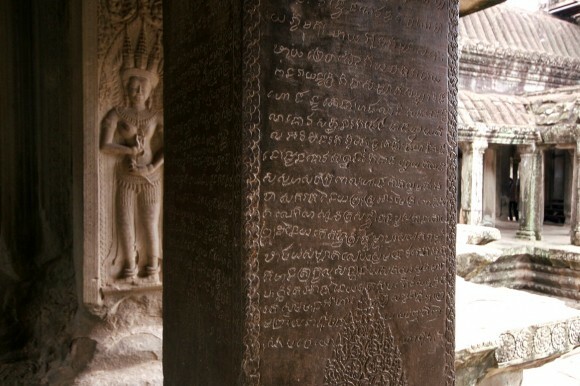 -Antonio de Madalena, 1586 – one of the first Westerners to visit Angkor Wat. 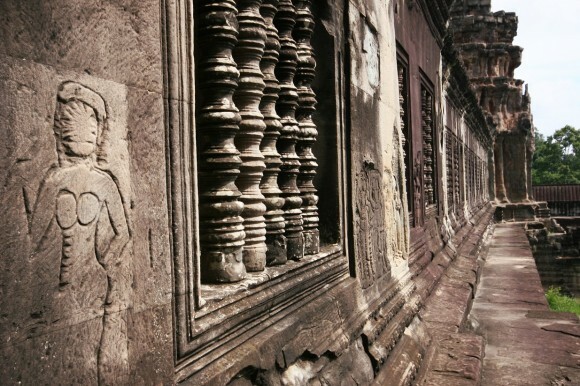 Today Angkor Wat is Southeast Asia’s number one tourist attraction. I was quite excited to see what all of the fuss was about, but I also wondered if it was truly as fascinating as everyone said it was. 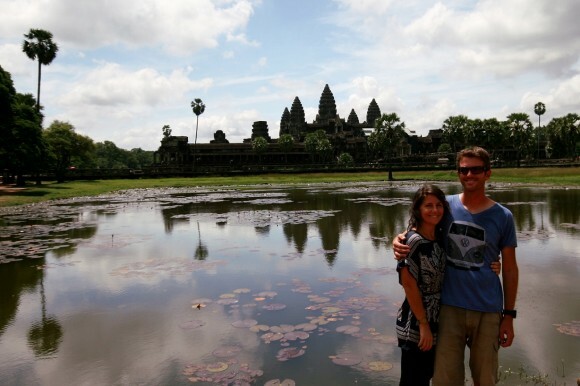 The Angkor Wat ruins would be our last destination before heading back to Thailand to begin the shipping process to India. 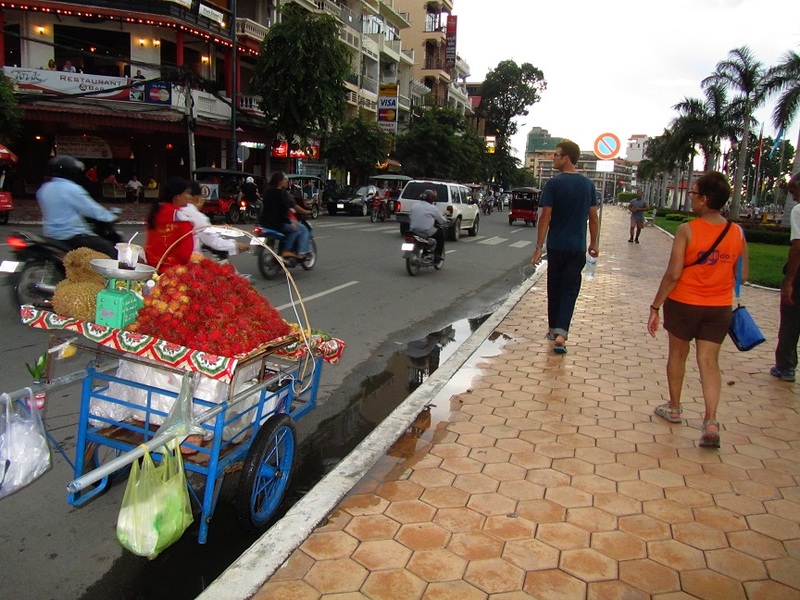 I hoped we’d be leaving our Southeast Asia leg of the trip with a bang. 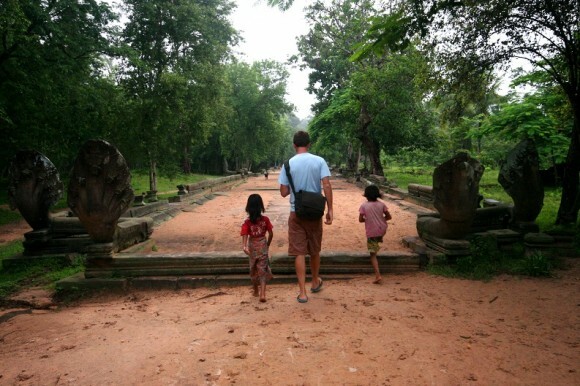 We arrived midday in Siem Reap and quickly decided we weren’t quite ready to explore the ruins. Instead we took advantage of Siem Reap’s tourist infrastructure and the air conditioning at a Swensen’s ice cream chain while endless sheets of rain finally extinguished the intense heat of the day. I left Brad behind and transitioned to the town’s covered market. There was an authentic section of the market devoted to fruits and vegetables, meat, and household goods and then there was the tourist market: a puzzle of aisles devoted to replicas of Angkor Wat, Buddha statues, wooden elephants, silk scarves, and the all purpose plaid Cambodian cloth used by all of the local people. A half an hour in the market was enough. If I even so much turned my head in the direction of a stand an explosion of frenzy would occur. After purchasing an unlikely souvenir of black sticky rice and tomatoes we left Siem Reap and sought out a camping location for the night. Just before nightfall we were granted permission from a local tourist official to camp in the parking lot of a rarely visited ruin. 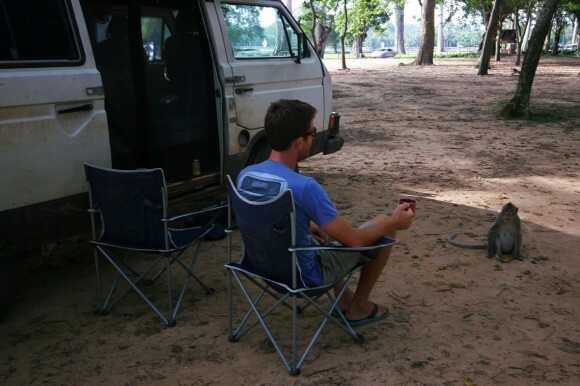 As I began to cook Brad set up camp, snapping our front curtain in place and laying out our new hand woven bamboo mat. This was going to be one of those perfect nights: a grassy parking lot and a quiet street. Midway through dinner preparations the tourist official returned and peered in at us from outside. Our procrastination paid off. While Brad followed him down the winding road, I held our half-cooked meal over the stove. He stopped a few minutes later in front of a Buddhist temple. Brad walked inside and came back out a few minutes later with the thumbs up. In an instant the entire community of orange-robed monks filled our sliding door. We talked with them for a long time and the conversation went all over the place. 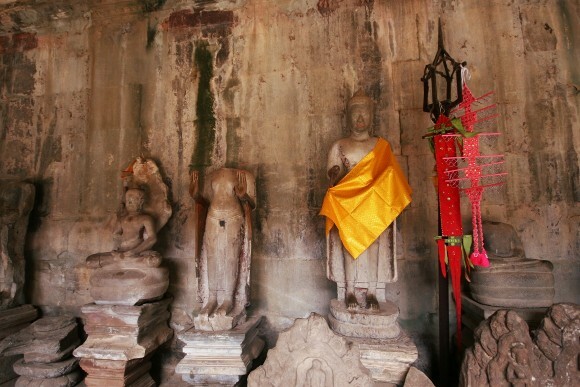 We went to sleep to the beautiful melody of monks chanting. 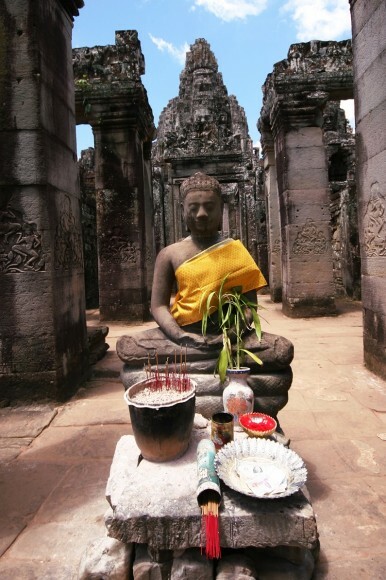 We woke up to the mesmerizing sound of monks chanting. After breakfast the senior monk greeted us and apologized for having chanted so late into the night, and expressed his sympathies for having chanted so early in the morning. He was surprised when we told him we loved it–an experience so surreal we’ll question later in life whether it was dream or reality. 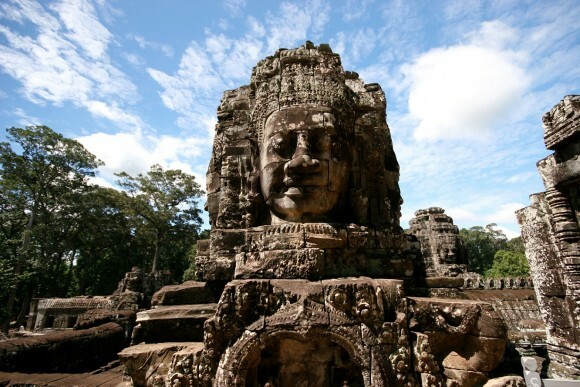 We dedicated the day to Angkor Thom, the last capital city of the Khmer Empire and the second most popular set of ruins in the area. 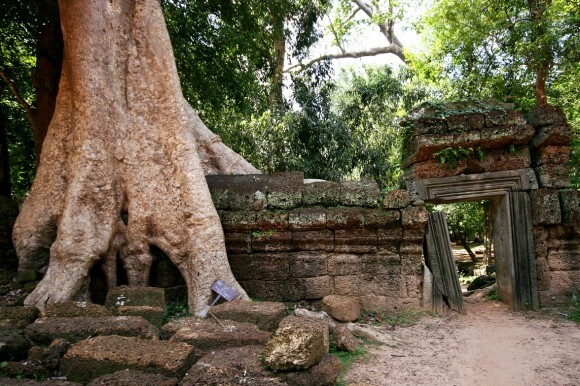 It was built in the late twelfth century under King Jayavarman’s rule and remained the capital until the Khmer kingdom’s demise in 1609. To enter the ancient capital we crossed through a massive city wall by way of an incredible 36 foot tall gate decorated with a face looking down at us. We could hardly believe that we were able to drive straight into the ruins, passing through the same gate that once provided thoroughfare for war horses, men returning home from battle, and the King. 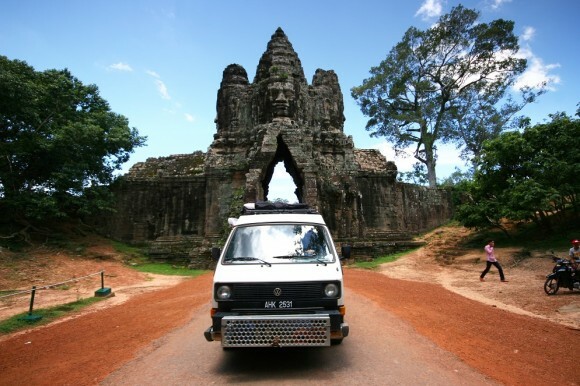 We followed a perfectly straight road to the center of the grounds where the capital’s iconic temple, the Bayon, was built. 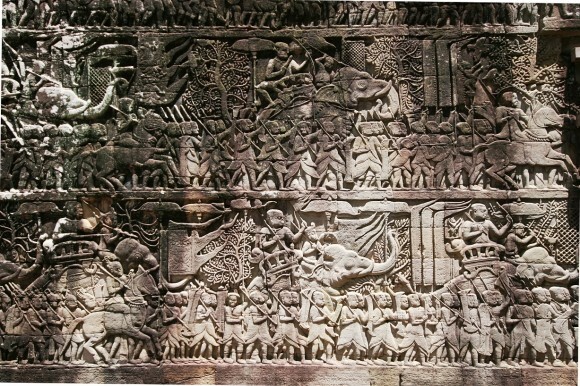 A set of walls decorated in extraordinary bas-relief scenes of battles, Cambodian daily life and legends encircled the center of the temple. Beyond the walls, corridors led to steep stairs, windows framed rooms like picture frames, and endless seductive goddesses adorned every surface. 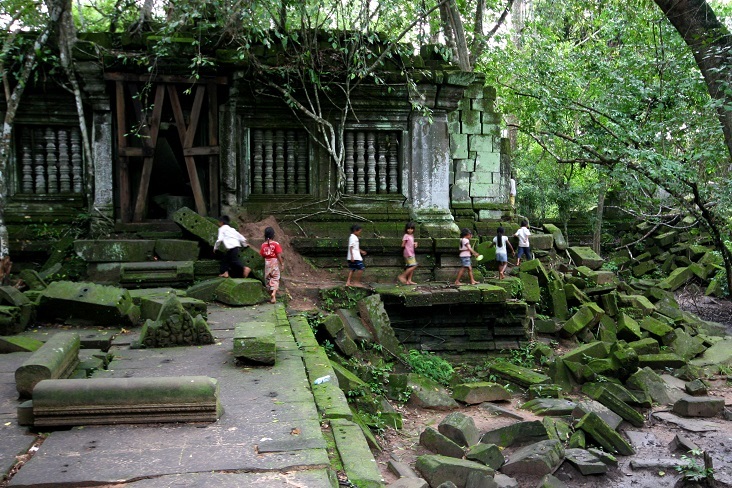 We climbed up a steep flight of stairs to the temple’s second level and stared out to a spectacular view of the surrounding forest and ruins. Carved faces completely surrounded us–106 of them in total, each of the 54 towers bearing four faces. 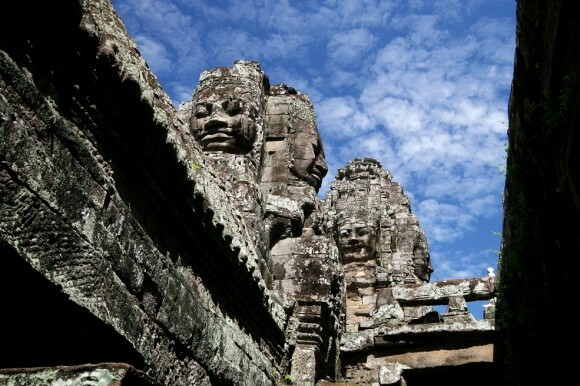 The towers represented the King’s 54 provinces, while the faces, bearing an uncanny resemblance to the king himself, symbolized the King’s watchful eyes over all his people. 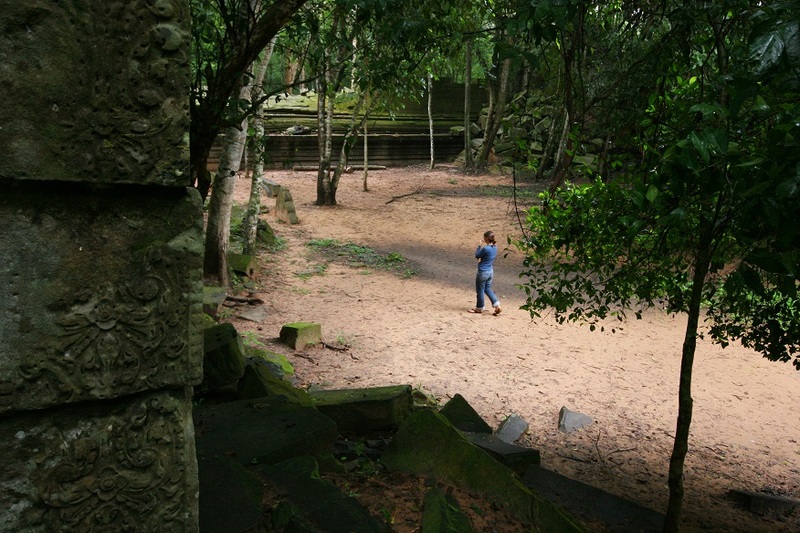 Angkor Thom far surpassed our expectations and I was at a loss as to why I hadn’t heard of it before. 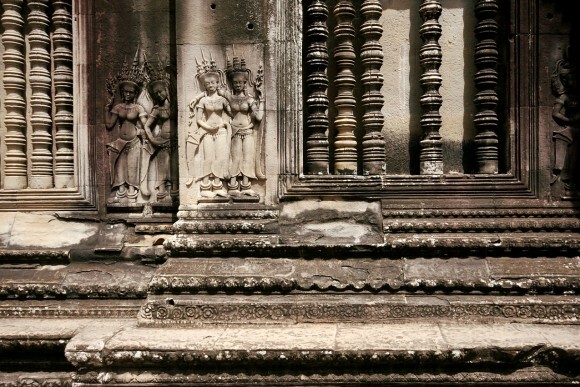 All I could think was that Angkor Wat must have been something spectacular to have overshadowed these ruins. 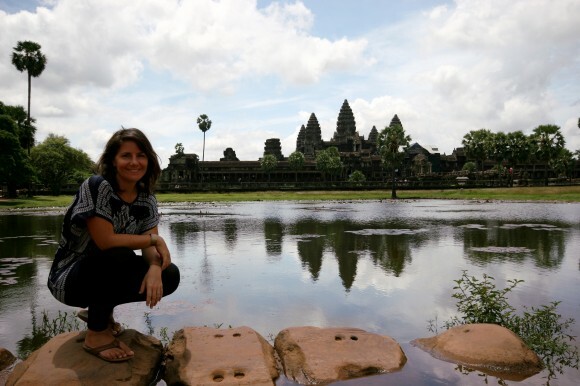 It was Angkor Wat day: icing on the cake to an already spectacular few days. As the world’s largest religious monument it’s known for its immaculately preserved state, its beauty and the story behind its existence. 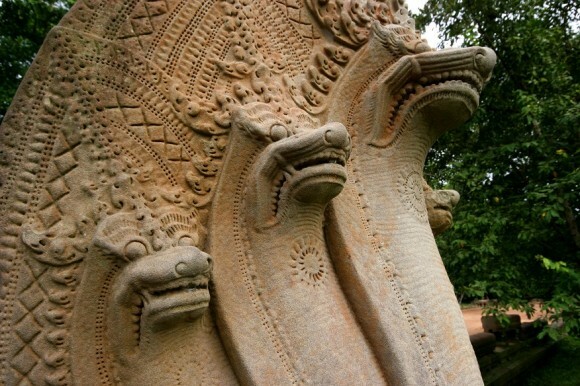 While many temples are built to honor the ruling king of the time, Angkor Wat was built to honor the god Vishnu. 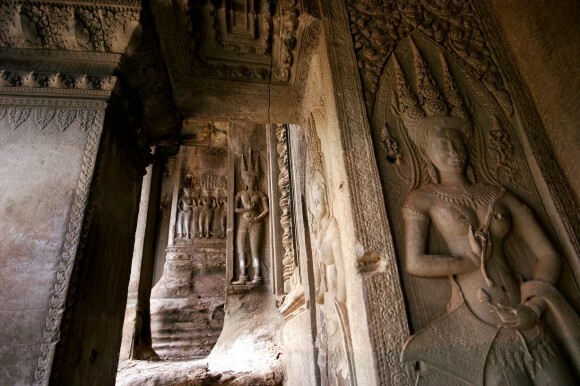 Its purpose was to provide a funeral location for King Suryavarman and it was built facing West, representing death in Hindu cosmology. 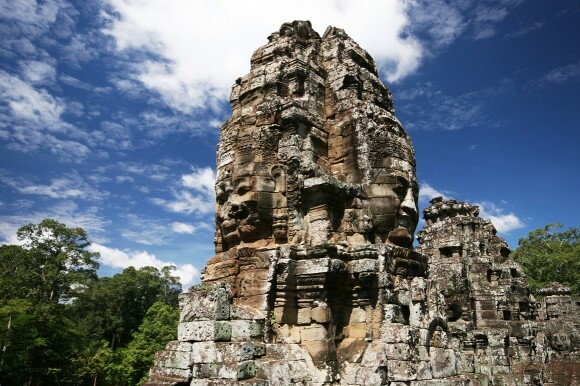 Furthermore the temple’s foundation was built to symbolize the mythic Mount Meru with its five inter-nested walls representing a chain of mountains and its moat representing the cosmic ocean. 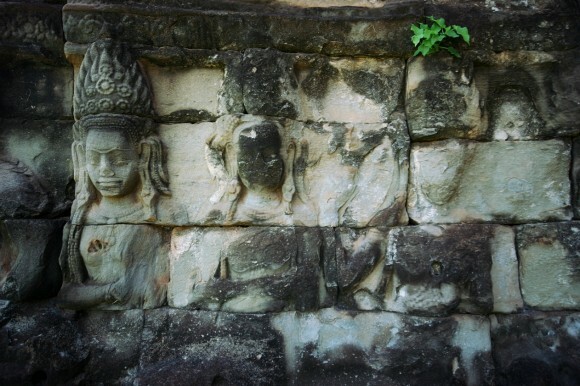 Angor Wat also played a larger role alongside the other major temples in the Khmer Empire. Each was purposefully arranged in a specific location to mirror the stars of the constellation of Draco at the time of 10,500 BC. This arrangement was meant to create harmony between the heavens and the earth and the stars. 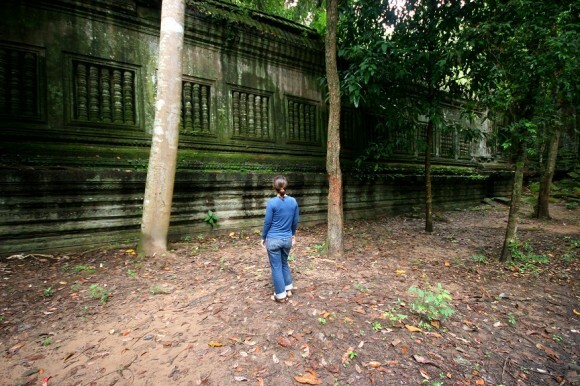 To enter into Angkor Wat we passed over an incredible 600 foot wide moat by stone bridge, sturdy but damaged with upturned stones littering the ground and its center peeled upward. The bridge continued well past the moat and chauffeured us through the first set of walls. The walls and the buildings and everything around us were made of sandstone carried from a quarry 25 miles away, all 5 million TONS of it. It’s a wonder how this was accomplished but with 600 elephants and 300,000 workers I suppose anything is possible. 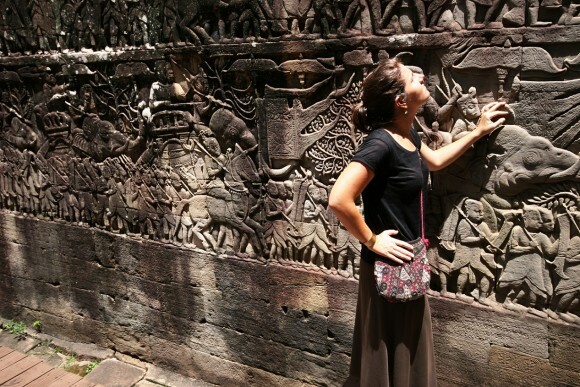 Like Angkor Thom we passed through several galleries decorated in incredible bas-reliefs. The panels stretched for 2,400 feet and like ancient comic books told stories of epic events in a counter clockwise direction—another symbol of death. A quick observation identified where the bas reliefs had been touched countless times; an elephant’s head or the breast’s of a woman, polished black and shiny like marble. Farther into the temple the epic bas-reliefs ended and the theme changed. 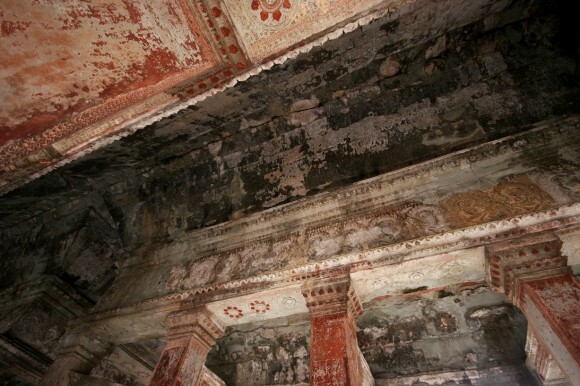 On seemingly every wall and pillar, seductive asparas, or goddesses decorated the surfaces. There were also ancient Buddha statues, painted rooftops and pillars, script and unfinished work, but the goddesses were easily my favorite. 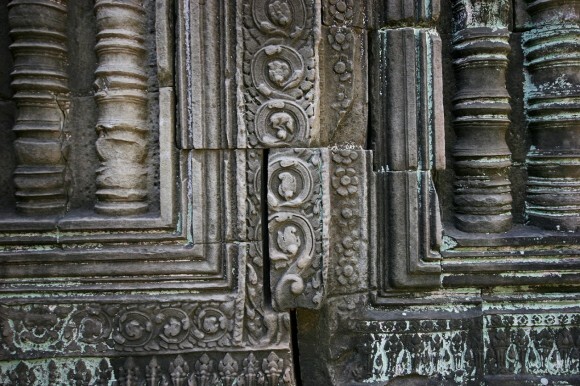 The unfinished works also surprised me and I learned Angkor Wat was never entirely completed. 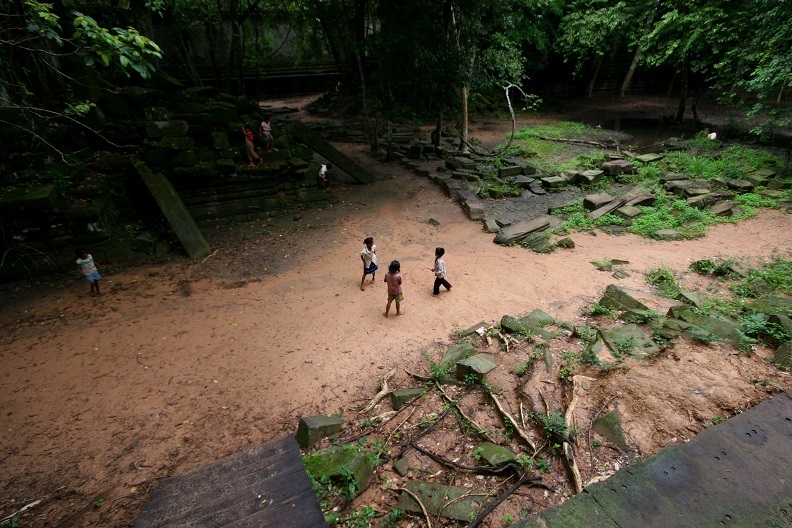 For lunch we set up picnic at nearby Angkor Thom. Monkeys joined us and then retreated back to the trees, and eventually we left too. 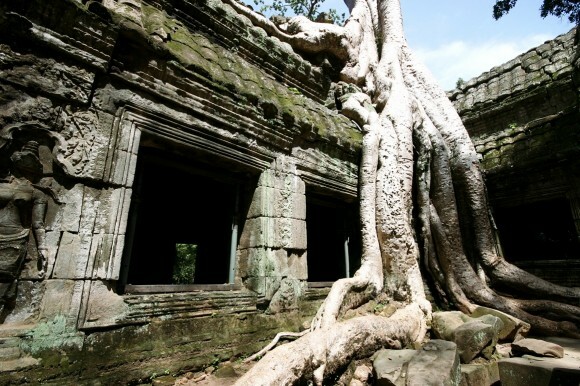 The last ruin we saw was Ta Prohm. It is the only temple in the Angkor ruins where the jungle trees had essentially been left as they were found. I felt like we had walked into a lost world like Angelina Jolie in Tomb Raider (this was a filming location.) 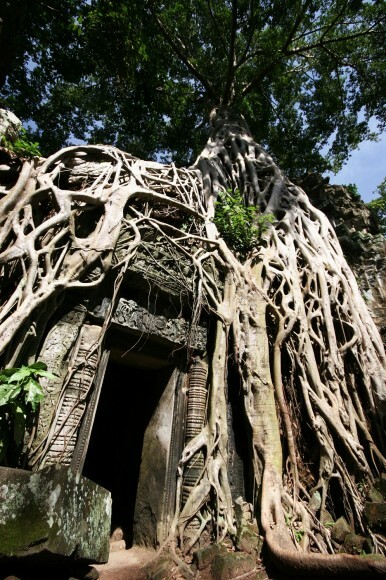 The place had incredible atmosphere and the tree’s parasitic root systems tangled their bodies around the many corridors and walls, blocking alleys and crippling the temple’s structure. 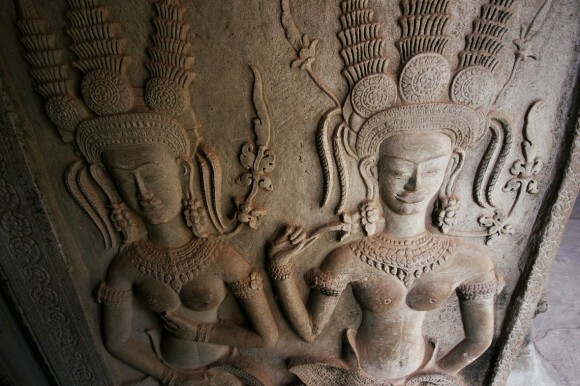 We left Ta Prohm feeling complete. 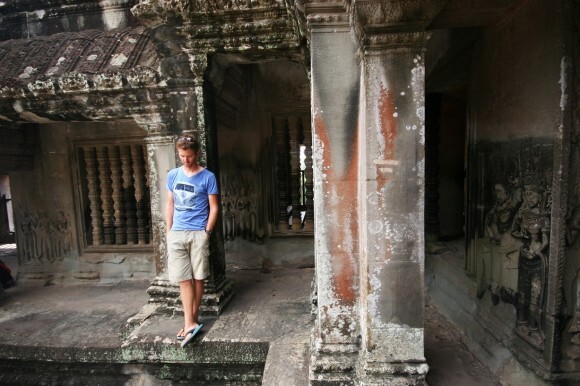 We could have easily spent a week exploring the vast area and still had not seen all of the temples. 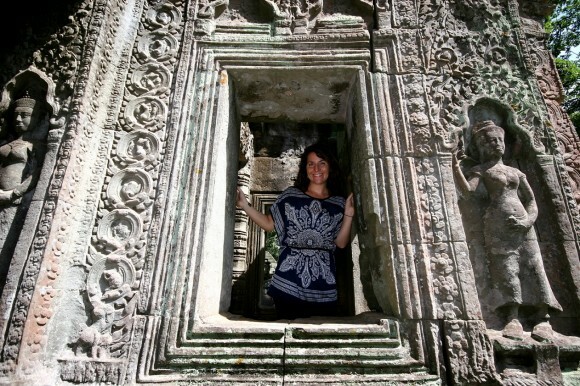 The Angkor ruins WERE as spectacular as everyone said. 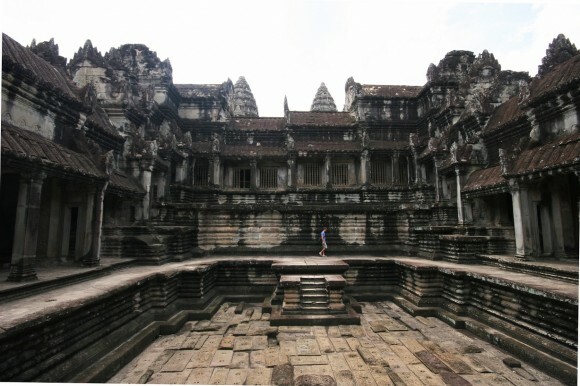 They were easily the most splendid of religious buildings we had seen in all of Southeast Asia AND in the Americas. And to think, this was only what remained. I must say, this is one of those places you just have to see sometime in your lifetime. In Cambodia’s west-central jungles lie the ruins of an ancient Khmer kingdom, at the center of which sits the impressive site of Angkor Wat. There are innumerable ruins of palaces, temples, and royal buildings immediately surrounding Angkor Wat, but it was an outpost an hour off to the northeast that initially caught our attention. 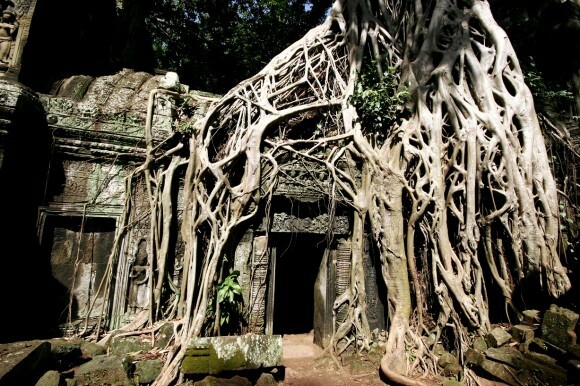 We had heard stories of ruins still covered by dense overgrowth; a look into what the ruins would have looked like before their uncovering by archaeologists; a place to be discovered by the rays of sunlight seeping through dense vines that hang from centuries old strangler fig trees. 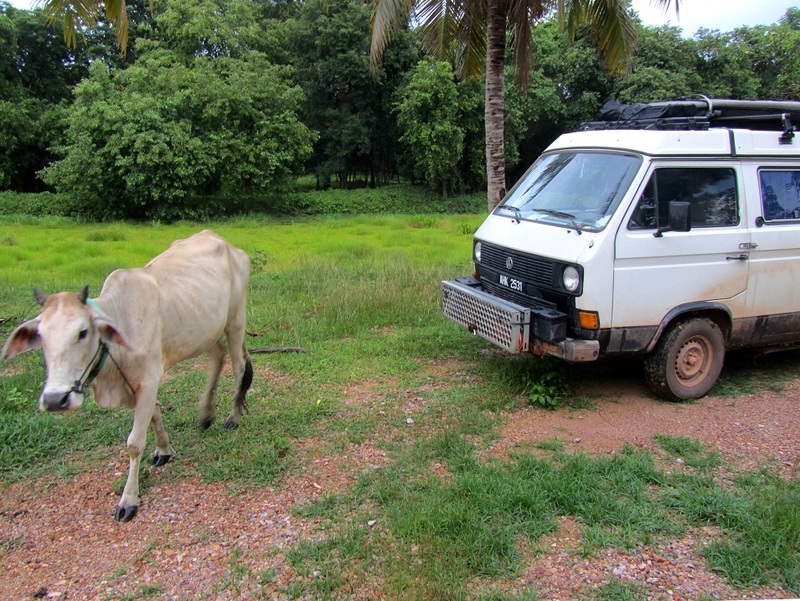 As the road signs indicated Siem Reap 30 miles ahead, we turned Nacho onto a tiny side road that wound through rice paddies and villages toward the North. Soon the villages dissipated and the countryside became a patchwork of jungle and rice fields. And then we arrived at Beng Mealea. It was late in the afternoon and a lone bus carrying some of the more adventurous tourists departed just as we arrived, and then we had the whole place to ourselves. We found a spot right next to the highly decorated stone promenade leading to the entrance of the complex, and declared a camp site for ourselves. 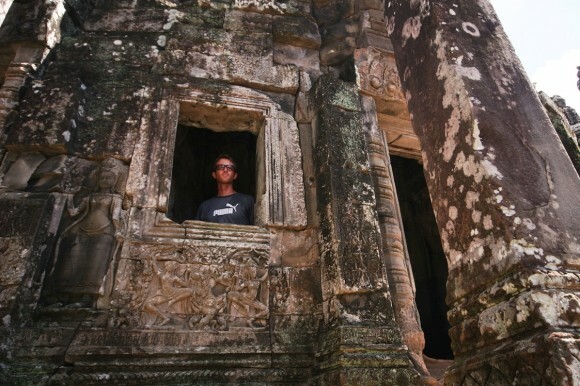 Given the limited time before sunset, we decided to wait until the morning to explore the ruins. Instead, we locked our doors and walked farther into the jungle on the muddy dirt road on which we’d arrived. The road wound its way into the jungle, past rice paddies and a few stick huts, before splitting. At the fork in the road we noticed a trail heading into the jungle. 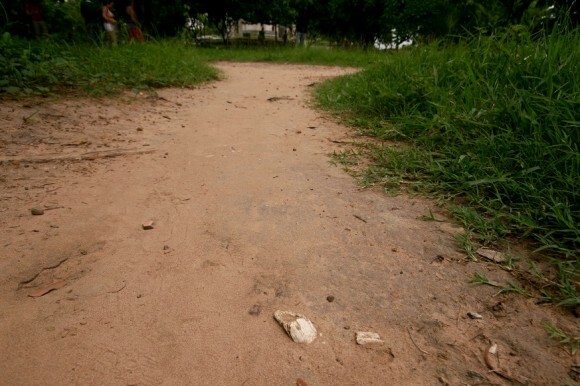 We had been warned that thousands of unexploded land mines still littered this jungle, but we figured that if we stayed on a worn footpath then we’d probably be safe. 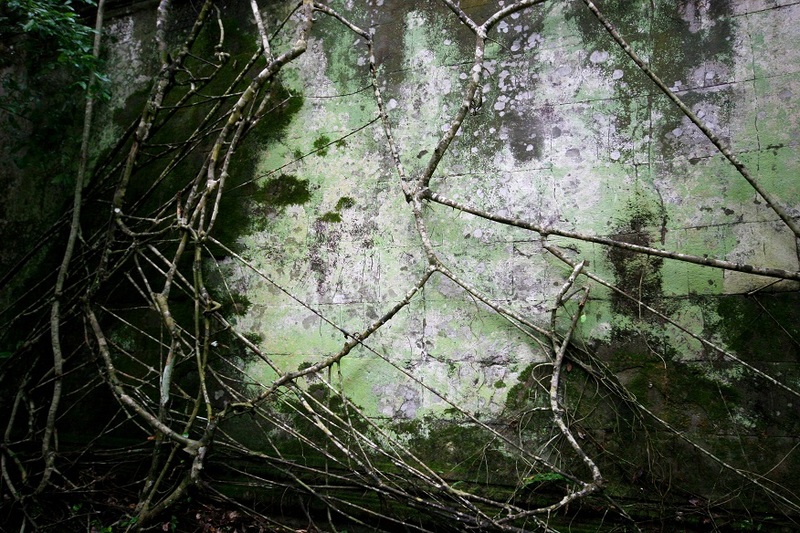 We entered the dark undergrowth. 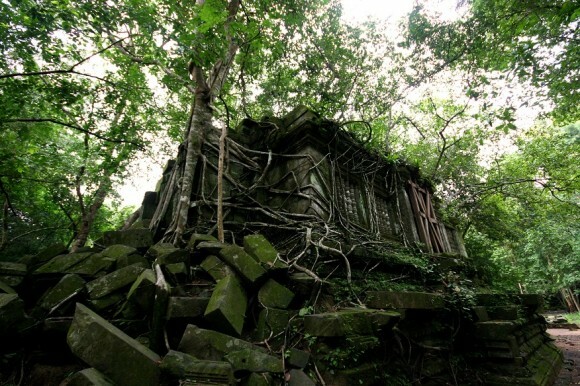 The trail wound its way through the trees for a while, and soon we noticed some half-buried hand carved stone work protruding from the jungle floor. 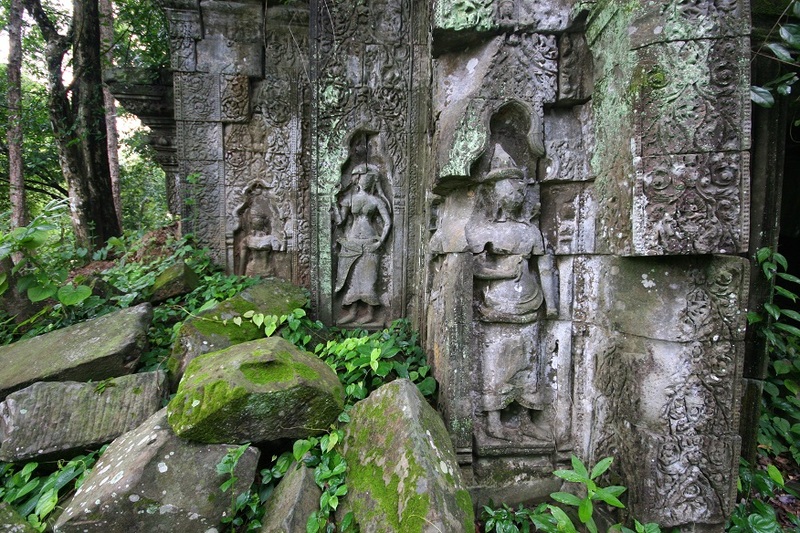 As we walked on through the dense foliage more and more stone carvings were noticeable under cover of vines and half buried in the mud. Suddenly the trail hooked to the left and we found ourselves on an unexcavated stone thoroughfare of some kind, lined on both sides by intricate carved statues of seven-headed snake creatures, ferns, and round columns. 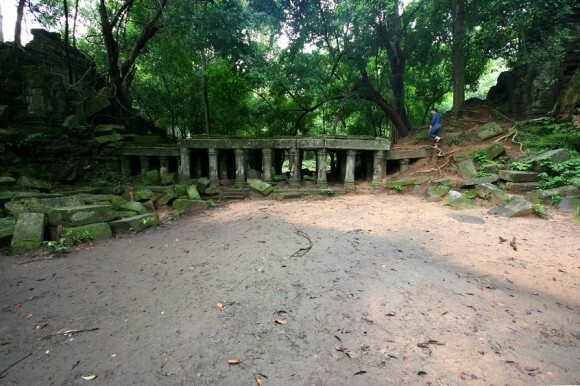 We felt what it must have been like for the first discoverers of this site, to be walking in the jungle and to come upon fragments of an ancient civilization. Our minds flashed back to our accidental discovery near Tikal in Northern Guatemala. 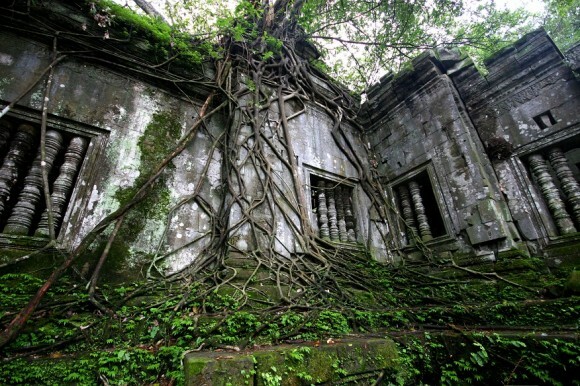 We followed the thoroughfare farther and its condition continued to improve until through the trees we could see an enormous stone wall, partially toppled by the swollen root of a strangler fig. We’d accidentally found our way to an ancient road used to access the complex of Beng Mealea. We carried on and in the evening’s fading light found ourselves alone in the crumbling ruins, walking through walls decorated by intricate carvings, enormous arches adorned with snakes and elephants and script, and stepping over enormous stone blocks dislodged by roots and toppled onto the jungle floor. After a brief survey of the complex we made our way around to the main entrance and found our way back to Nacho for the night. In the morning we awoke early. We wanted to be inside of the complex when the first rays of sunlight permeated the jungle canopy and cast columns of light on the ruined walls. At 5:30 we walked down the stone promenade toward the ruins, wiping the sleep from our eyes. Soon we were joined in stride by a small disheveled girl and her disheveled friend. She was so cute and tiny, and spoke in such a funny little chipmunk voice. She stared up at us and put her hand out, and then repeated herself. Her tiny mouth formed into the shape of an upside down horseshoe and she made her voice crack as though she were about to cry. “One-dolla…chia?” she repeated, dragging the last word out for drama and following it up with a sniffle. 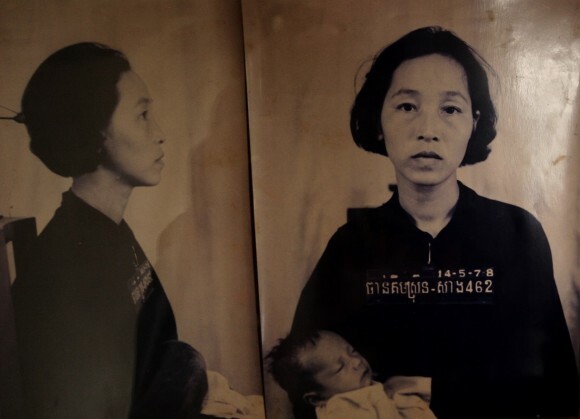 It became clear that someone—probably her parents—had taught her how to ask foreigners for money. 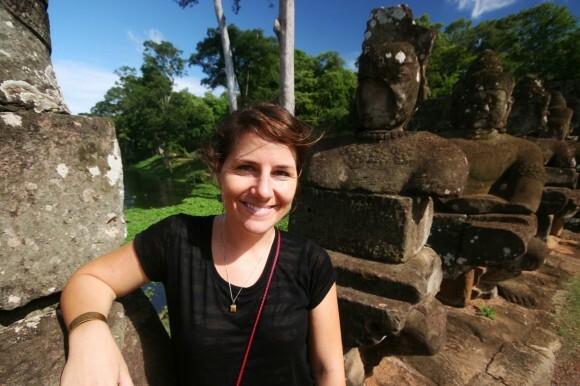 She had taken “one dollar each,” and without a basis for the English language had transposed the sounds to “one dolla chia,” which sounds extremely cute when coming from the mouth of a tiny Cambodian chipmunk girl. But when it comes to giving away free money to perfectly able-bodied beggars, regardless of body mass, age, gender, or voice pitch, I am heartless and cutthroat. 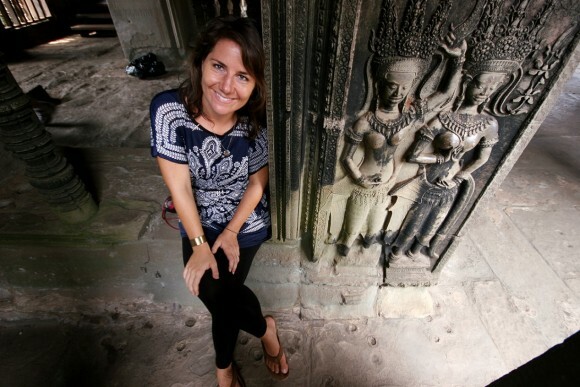 The girl continued to follow us around for ten or fifteen more minutes as we entered the ruins and crawled over the giant carved blocks that were strewn about. Finally she gave up and disappeared. 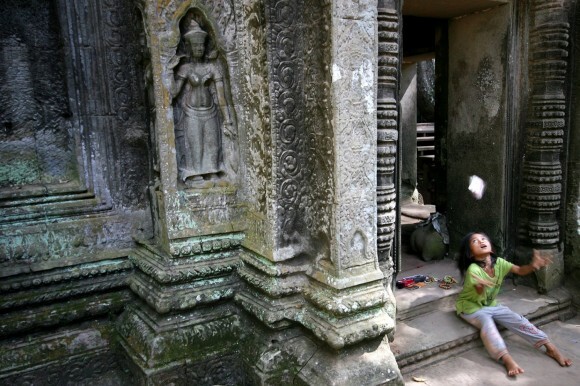 A few minutes later tiny children began appearing on top of the tall walls of the ruins. They walked about with ease, oblivious to the deadly drops to either side, and they jumped from stone to stone over deep crevasses and over vines. 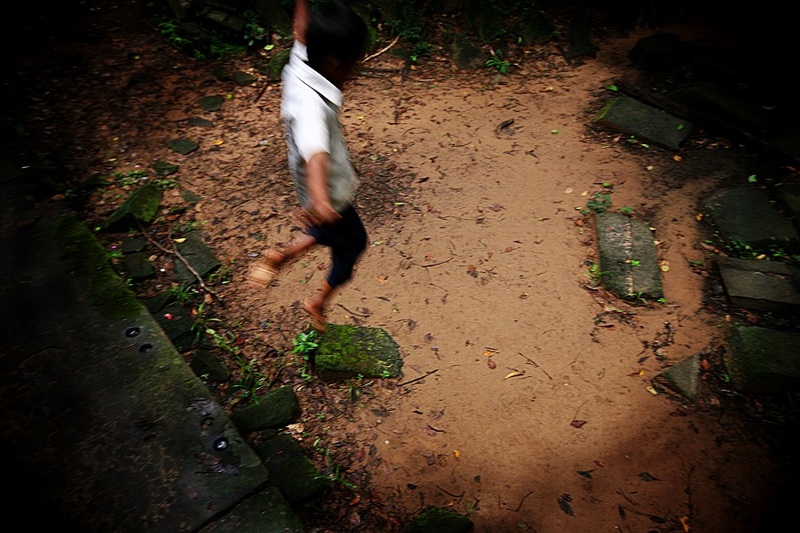 They wore no shoes, and were as agile as monkeys. They were the children of the nearby stick huts, and rather than go to school they roamed around the ancient ruins in packs. Sheena and I walked along an elevated stone walkway midway up one of the enormous walls, and as we did the pack of children approached from the opposite direction. They marched toward us in single file, and as they reached us they flung themselves like lemmings, one by one, off of the wall to the hard ground below. One-Dolla-Chia was the last one in the pack, and before flinging herself off of the wall she glared deep into my eyes and gave me a colossal stink eye. The ruins were spectacular, like something that time forgot. 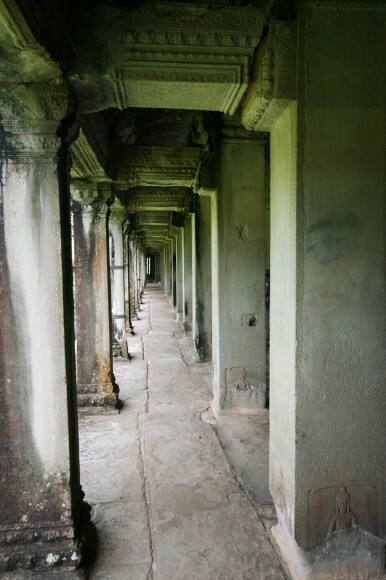 The complex was surrounded by a high and thick protective wall, and inside there was a vast collection of rooms, covered hallways, an underground corridor, and various walls covered in elaborate inscriptions. 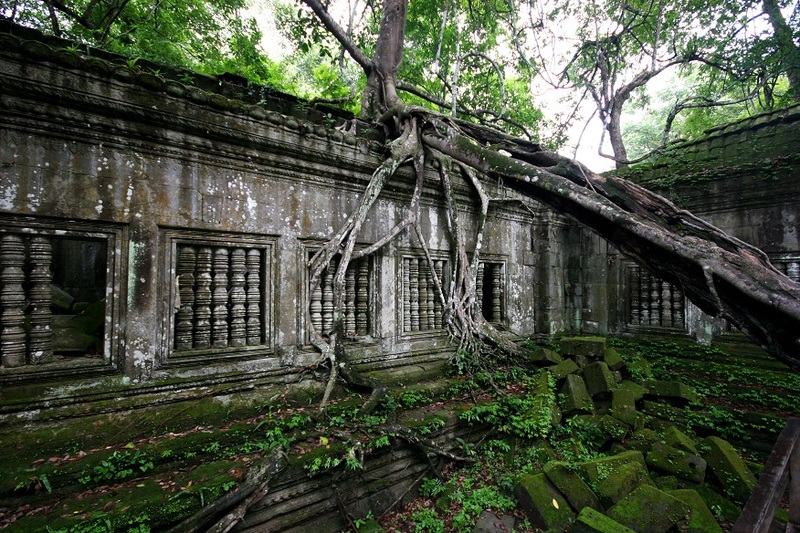 The open spaces were filled with giant trees, and many of the structures were topped by giant strangler figs, named for their creeping roots that seem to strangle the ruins below them, and whose roots grow through the walls and then swell up over time, causing entire walls and columns to topple. By 9:00 in the morning we had explored the entire complex; we had been there for the first rays of light seeping through the canopy, and in the absence of other people we had seen the place much in the same condition as it was discovered. On the walkway heading out of the complex toward Nacho, we passed by the first group of tourists for the day. And out of the woodwork came One Dolla Chia. WARNING: This blog post contains graphic content. 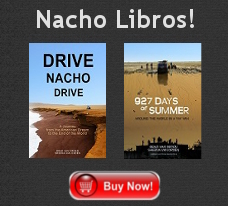 We highly encourage you to read it for your own education, but be aware that you will probably find it disturbing. There is a high school in downtown Phnom Penh, Cambodia, known as S21. The facility is no longer used as a school on account of the blackness that fell upon it in the 1970’s. 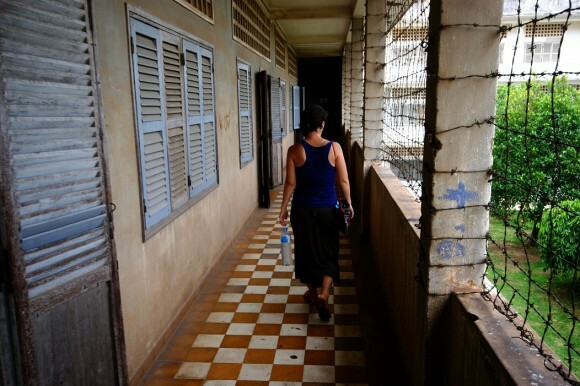 We wound our way through streets and alleyways, and when we saw the rusted razor wire atop the school’s perimeter wall, we knew that we’d arrived. In 1975, following the Vietnam War, a ravenous group of idealistic youths descended upon Cambodia’s capital, commanded by their leader, Pol Pot. 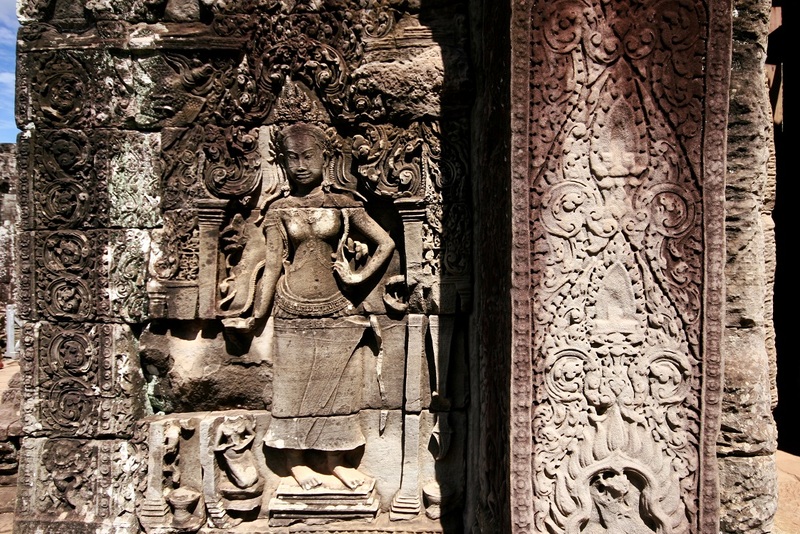 They believed that Buddhist Cambodia should abandon its capitalism and embrace fundamental communism by whatever means necessary. They called their party the Khmer Rouge. 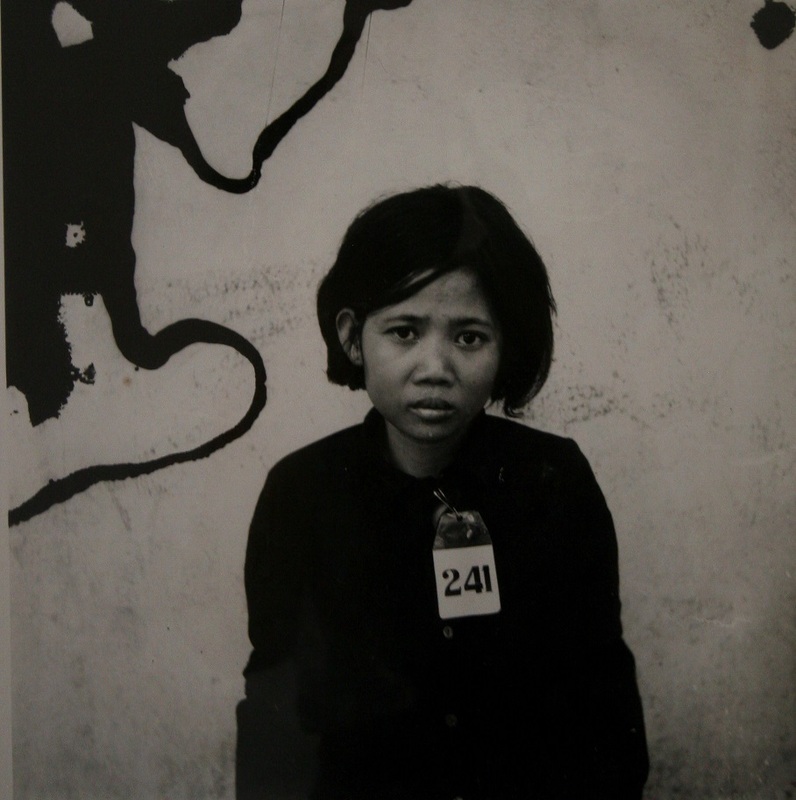 The unsuspecting capital quickly fell to the Khmer Rouge, and within days all of the capital’s inhabitants had been forcefully evacuated from the city and marched into the countryside to do communal labor. Soon the entire country had been overtaken, the borders were sealed, businesses were closed, and the population was forced into manual labor camps. 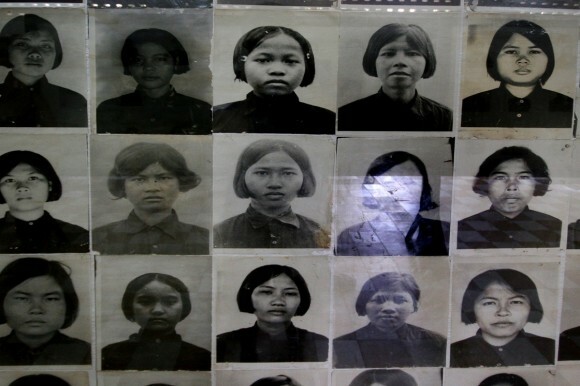 The first order of business for the Khmer Rouge was to carry out a process of brainwashing and the elimination of anyone with an education. Anyone who had been to college, who could speak a foreign language, who had worked as a professional, and those who wore glasses were silently removed from the work camps. Furthermore, anyone suspected of dissent was silently taken away. Nobody knew where the people were sent, but day after day families were broken up and nobody knew when the day would come that they would be carted off. 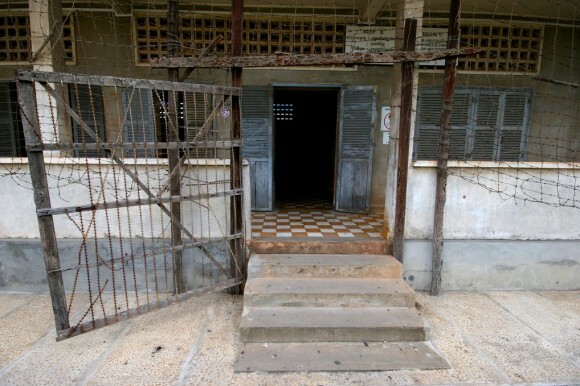 The S21 school had been turned into an interrogation facility. Whenever someone was suspected to harbor feelings of dissent against the party, they were brought here. The purpose for being taken to S21 was never explained to the subjects, and initially they went along without suspicion. 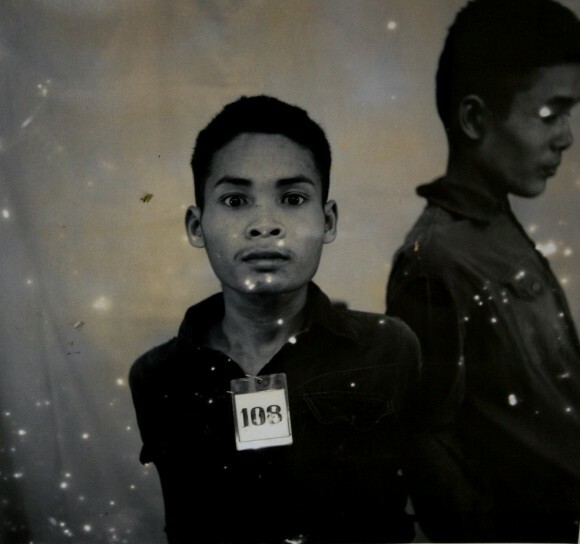 When they entered the school, each person was photographed and documented. The photographs of each person who passed through S21 are displayed on boards and walls in several of the classrooms in chronological order. The earliest photographs depict happy people, smiling and wide eyed in the same way that we have come to know modern Cambodians. 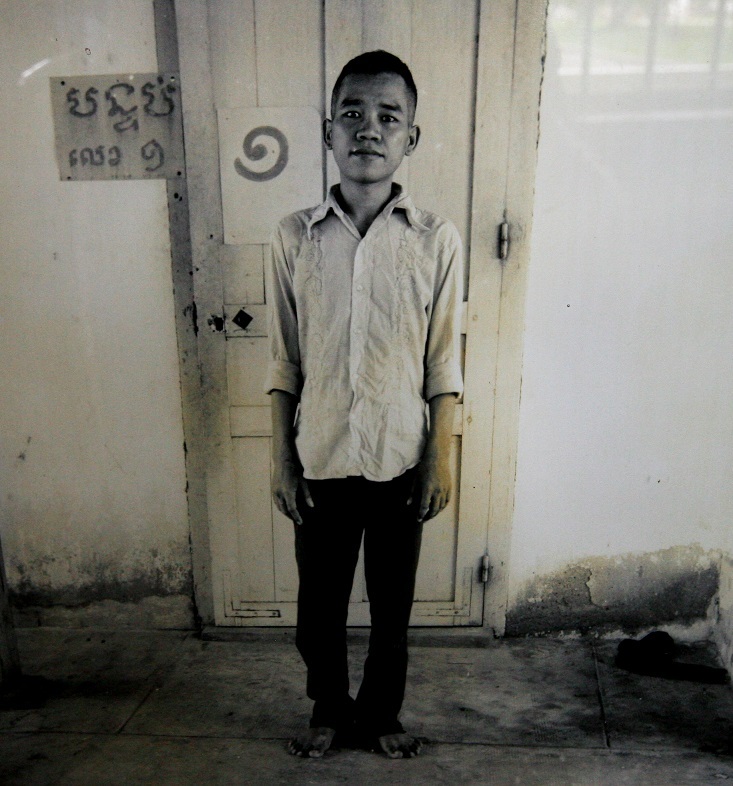 After being photographed, people were chained together and made to lie face down for days on end in classrooms-turned-holding cells while they awaited interrogation for made-up crimes. Dozens more classrooms were segmented into prison cells by crude brick walls. The real terror began as subjects were brought in for interrogation. 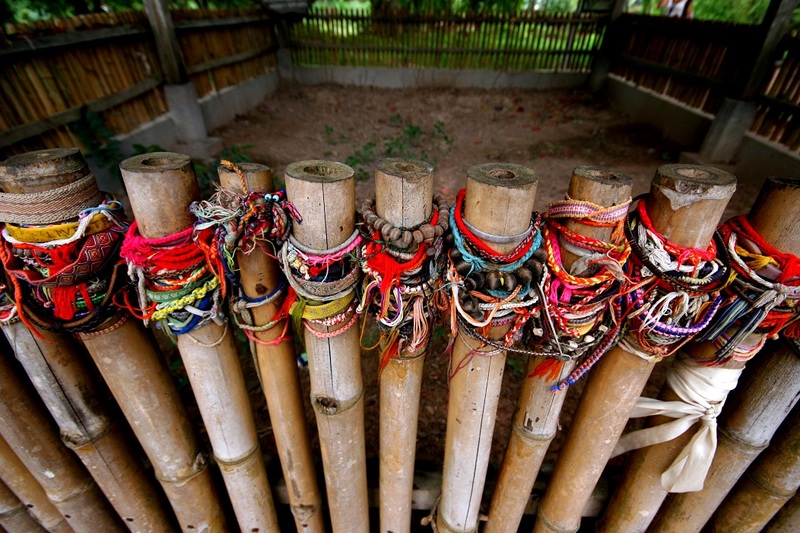 Men, women, children, and the elderly were asked to confess to crimes that they didn’t commit. When they refused, the torture began. We walked from room to room in the school as scenes of medieval torture unfolded before us. Fingers and toes were lopped off with diagonal cutters, arms and legs were broken with clubs or farming implements, teeth were pulled out or smashed in, and they had a special table for waterboarding. Some were hung upside down from a large wooden structure in the school’s courtyard and lowered face-first into large water tanks repeatedly for hours on end. If subjects admitted to the accusations, they were made to write confessions, and then they were executed on the spot or else sent to death camps in the countryside. If they refused to admit guilt, they were simply beaten and tortured until they died. As the population began to suspect the reality of what was happening at S21, the faces of the incoming subjects began to bear the horror of what was coming. Within four years, 17,000 people would be interrogated at S21. Only 12 would survive. Thirty five years after the horror ended, very little has changed at S21. 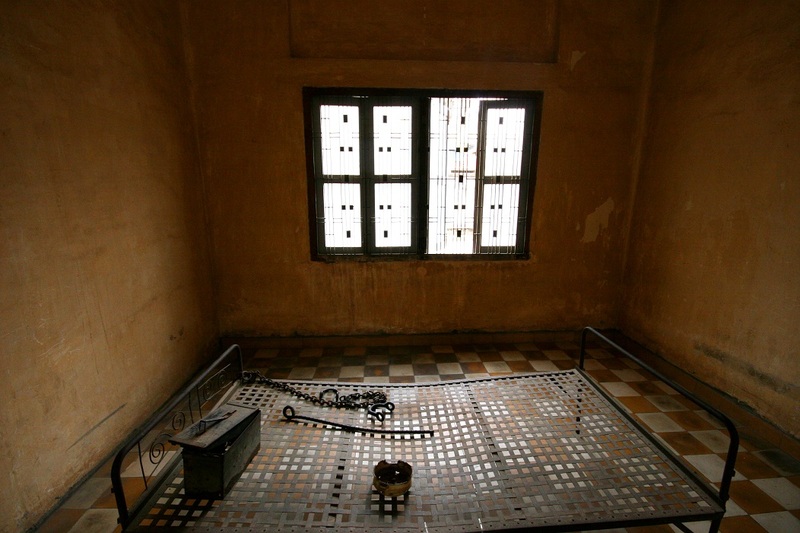 As we walked from one classroom to another, we found metal bed frames to which prisoners were chained and beaten. 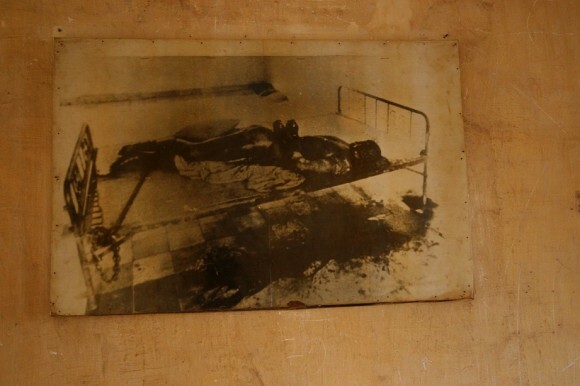 Photographs on the walls showed bludgeoned bodies still chained to the beds, suspended over coagulated pools of blood. 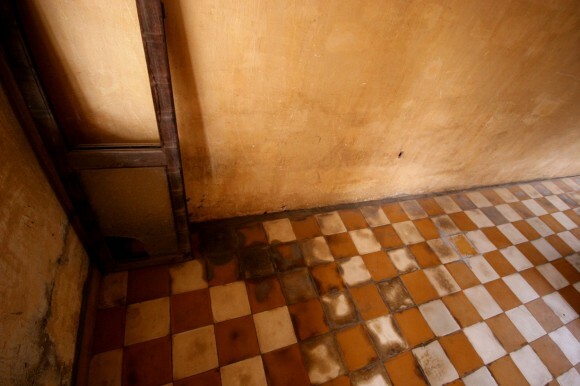 The tile floor in each classroom was permanently stained in blood. After a harrowing and emotional morning at S21, we got into Nacho and drove toward the killing field on Phnom Penh’s outskirts. It was to the killing fields where the Khmer Rouge sent the educated, the dissenters, and the falsely accused to be done away with. 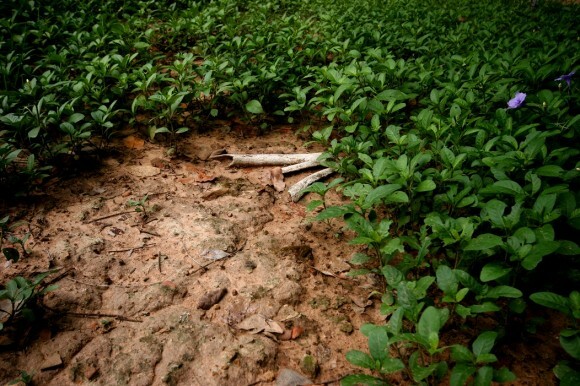 20,000 mass graves have since been discovered, but most are inaccessible, still surrounded by live land mines. The killing field is a vast plot of land, which is now completely covered by mass graves. 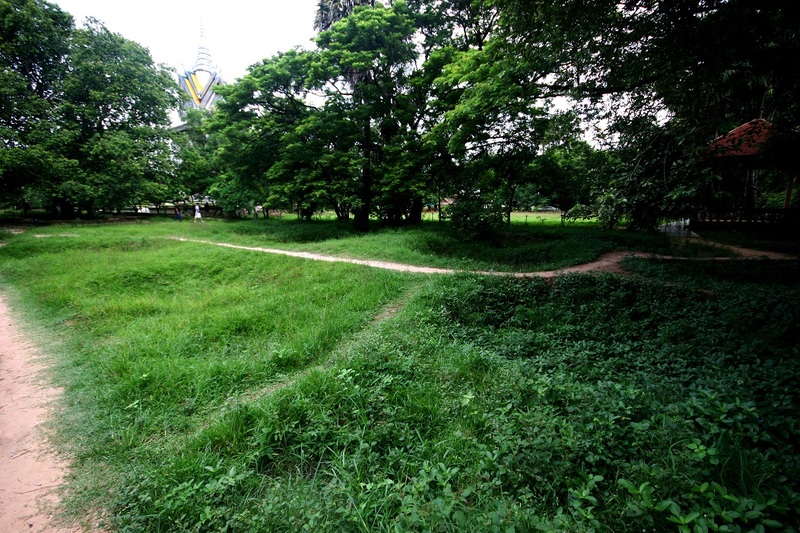 We walked into the area and were met by a scene of dozens of partially-excavated pits. Around the complex small shrines held bones, skulls, clothing, teeth, and other remembrances of the thousands who died there. When it rains, bones continually push up to the surface and can be seen everywhere—even in the middle of the walking paths. As we strolled through the peaceful landscape, we could feel the bones of the dead through the soles of our sandals as though they were pebbles on a trail. There is a large tree near the center of the killing field that is decorated with small bracelets, and to the side of it there is an excavated pit grave. 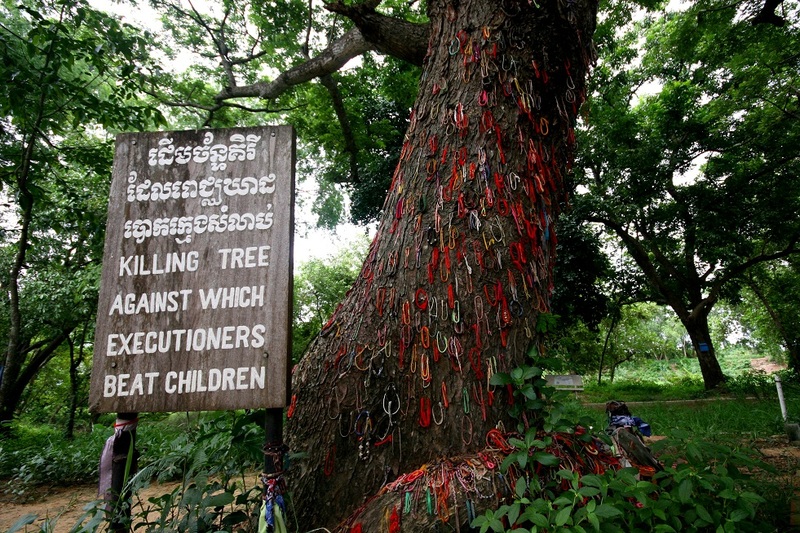 When the Khmer Rouge fell and this killing field was discovered, this tree was found covered in dried blood, hair, and scraps of skull bone and brain. Excavators began digging next to the tree and made a horrifying discovery. This was the tree that was used to kill babies and small children. The babies were held by their feet and swung into the tree to smash their heads, and then their lifeless bodies were tossed into the pit. It was one of the most disturbing things I’ve ever seen; a testament to the lows to which humans are capable of sinking. Executions at the dozens of other pits around the area were carried out in a similarly disturbing fashion. Prisoners arrived in trucks blindfolded, and were led to the pits. They were lined up and one by one they were pushed to their knees at the edge of the pit. 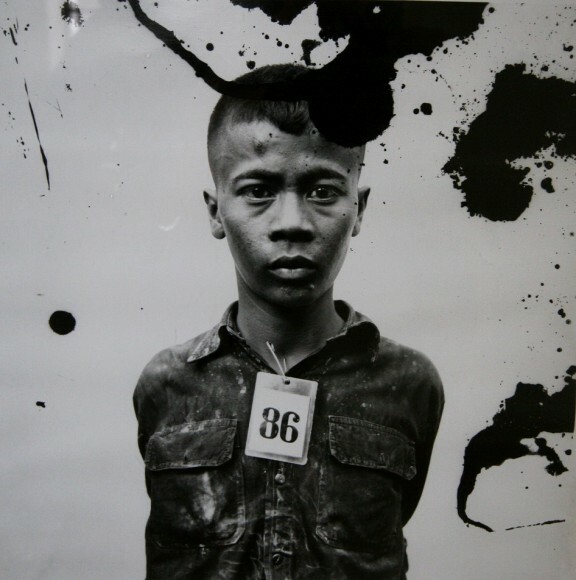 The executioners were ordinary Cambodians, forced to do this task lest they themselves be killed, and executions were carried out 24 hours per day without any stopping. Lacking guns or other weapons, they were forced to use more rudimentary implements. From the leaves of the surrounding palm trees they created cutting tools, and when the prisoner knelt by the pit the executioner would first saw the jagged edge of the palm stem across their throat so that they would be unable to scream. Next, they would swing a farm tool such as a hoe, a hammer, or a shovel against the back of the person’s head, killing them. The dead body would then fall into the pit, and the next person took their place. Prisoners brought to the killing fields were told that they were going to new work camps. Fearing that those waiting in the barracks would prematurely learn of their impending fate, the Khmer Rouge played communist party songs at ear-splitting volumes over loudspeakers throughout the fields at all hours of day and night, powered by loud diesel generators. They couldn’t hear their countrymen dying only a few meters from where they sat, crammed against their brothers, sisters, parents and neighbors. After several hours meandering around the fields we made our way to the Buddhist stupa built in remembrance of those who died there. 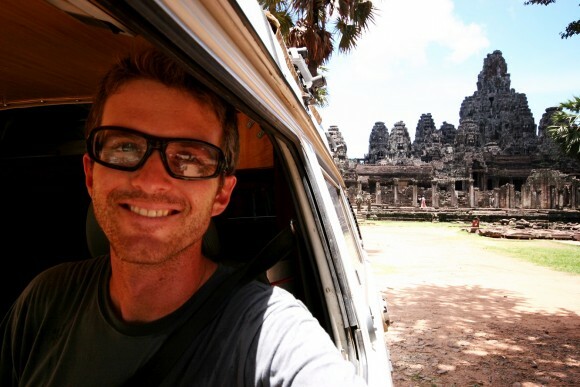 The stupa was built in a clear glass building, and contained over 5,000 of the skulls found at the site. We stared at the stacks of skulls, each bearing a hole from a hammer, a crack from a machete, or had its teeth smashed out. How could this happen—again? 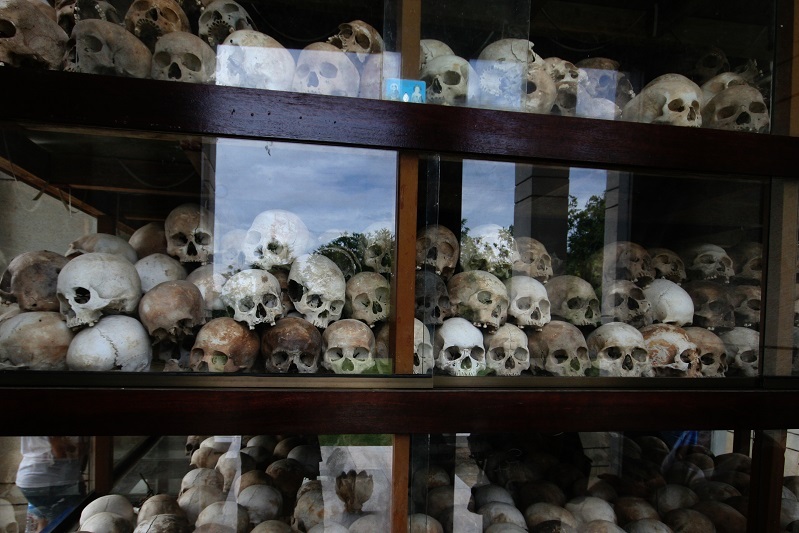 Pol Pot and the Khmer Rouge carried out genocide against its own people between the years of 1975 and 1978. In those four years, an estimated 2.5 million people were murdered—over 30% of the country’s population. Finally, in 1979 help arrived from the North. 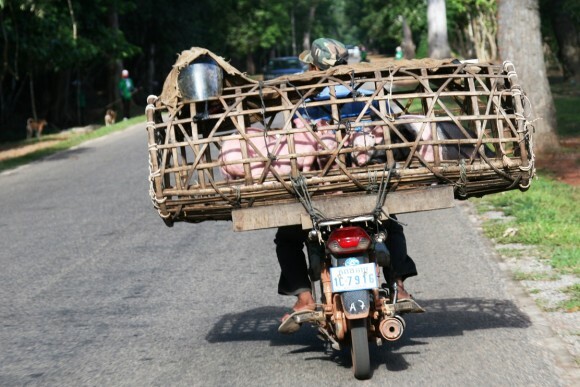 Vietnamese troops entered Cambodia and defeated the Khmer Rouge, sending their leaders fleeing into the jungle. The Vietnamese assisted Cambodia in forming a new government, and the healing process finally began. 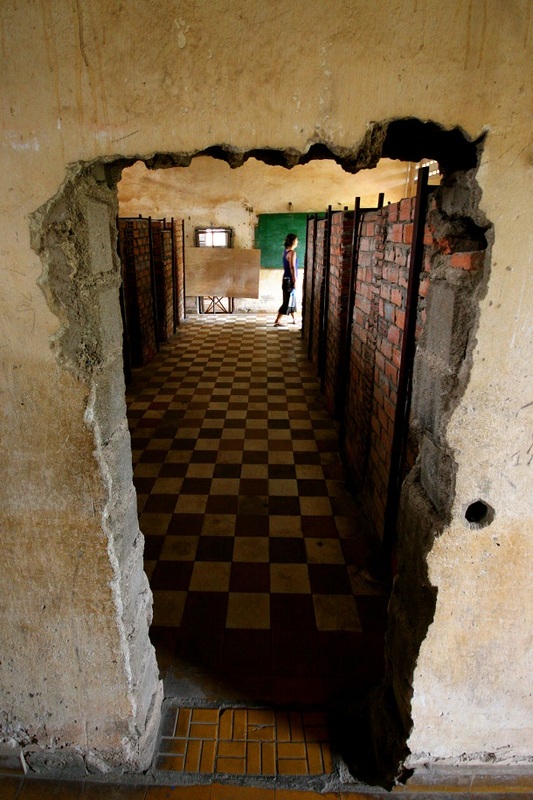 But despite the reprehensible atrocities carried out by Pol Pot and the Khmer Rouge, politics would intervene and deny Cambodians of dignity and closure. America was fresh out of the Vietnam War, and having lost the war, still harbored ill will toward Vietnam. America and its allies thusly refused to recognize Cambodia’s new government because it had been implemented by the Vietnamese. 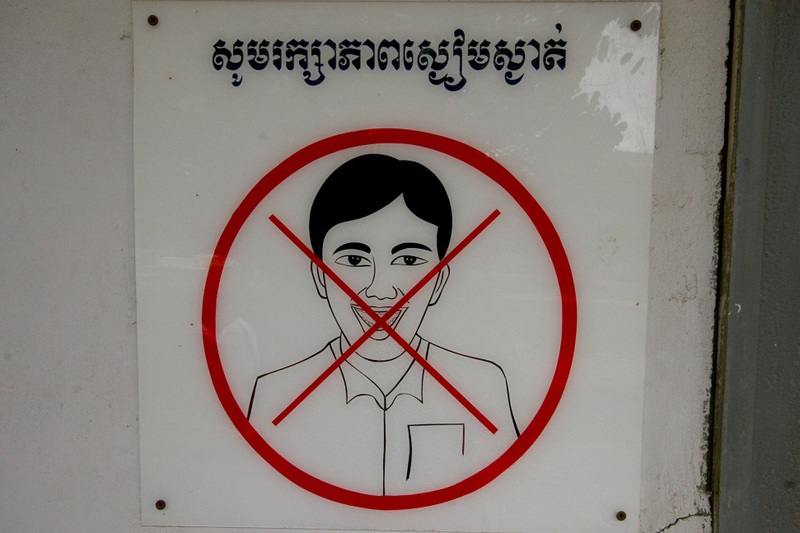 Instead, Pol Pot’s Khmer Rouge was officially recognized as Cambodia’s ruling government, and the Khmer Rouge was subsequently offered a place in the UN. 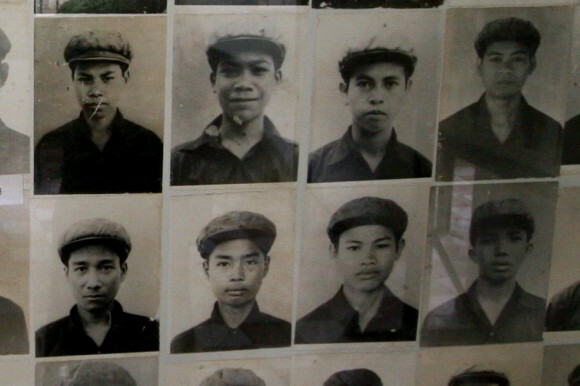 Substantial aid money was given by Western governments to the Khmer Rouge—the jungle-hiding murderers—to aid in rebuilding the country, for years to come. 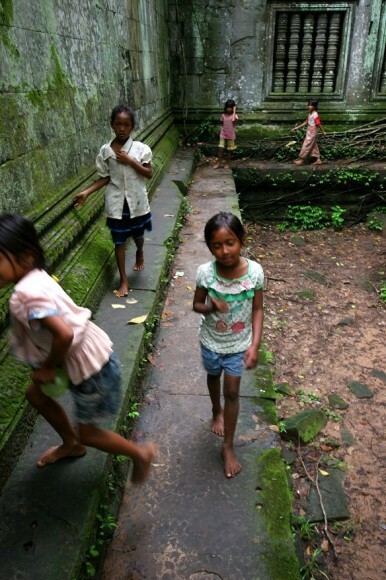 The money was used not to rebuild Cambodia, but to ensure the survival of the Khmer Rouge. America and the United Nations continued to recognize and support the Khmer Rouge up until 1993. And what of Pol Pot, Cambodia’s Hitler? He eventually came out of hiding and went on to live comfortably in his own home until he died in 1998 of natural causes at the age of 73. He was never tried for any crimes. 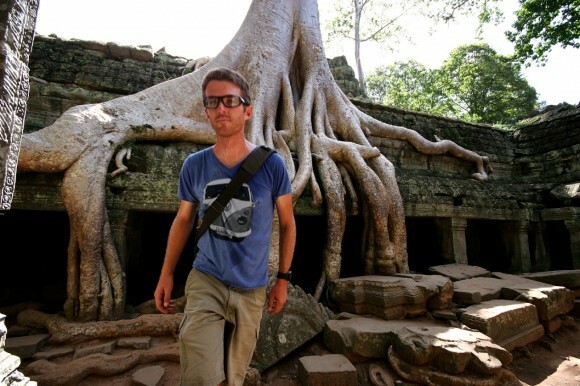 The following day we pointed Nacho north toward Siem Reap and Angkor Wat. Phnom Penh had been an educational experience for us, and again we found our history to be laced with ugly and embarrassing episodes that had escaped our school curriculum; in Cambodia we failed to act when aid was truly needed, unable to swallow our pride, and in doing so we had allowed an oppressive genocidal regime to maintain power for fifteen years too long. As we go forth into the world thinking that everything is peachy, and that our country is an unwavering model of decency, goodness, and humanitarianism, these experiences are necessary to fill the gaps in our global education and help us form a more complete picture of our role and our place in the world. What an education it’s been.